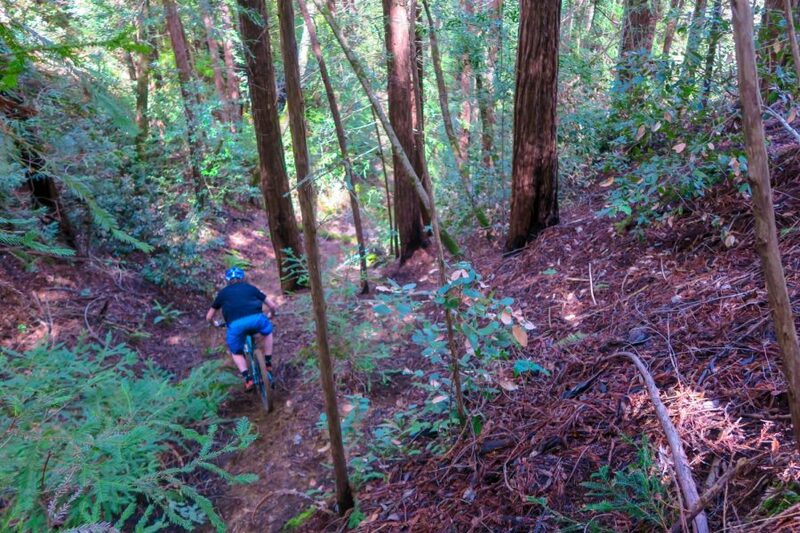 Mogan practices downhill downhill racing strategies on a small trail. He practiced on his Enduro bike, the one he will race on tomorrow. Mountain biking enthusiast Flynn Mogan regularly dedicates weekday afternoons and much of weekends to biking, so when it came time for him to prepare for a race that takes place tomorrow, not much in his schedule needed to change. Mogan’s training regime may sound brutal, but he says the adrenaline rush that comes with biking trumps its strenuous physical aspects. Although Mogan rides five days a week whether or not he has an upcoming race, riding in preparation of a big race is different from a leisure ride. “I work on climbing more and trying to get in the best shape I can be in for the race,” Mogan said. Climbing will be important for the SeaOtter Classic on April 19. Mogan won’t be racing in a downhill trail race, but he will rather be participating in a style of race that encompasses both uphill climbs and downhill descent. While climbing is involved in the race, only the downhill stages are timed. The climbs are meant to wear the athletes down, so that racers are tested while fighting through fatigue and pain. Enduro racing has been Mogan’s preferred racing style ever since his first Enduro race. Before Mogan started competitively racing, biking was still a major part of his life. Mogan’s passion to ride bikes turned into a love for racing and eventually an interest in other mountain biking related activities. Media in the biking world, like media in other extreme sports and outdoor activities, mainly involves blogging and photography, according to Mogan. A substantial cash payout would be helpful for a high school kid performing competitively in a sport that isn’t cheap. Although mountain biking equipment can cost thousands of dollars, Mogan is able to get biking gear with a deal. “I have connections in the biking industry so I am luckily able to get gear with special deals,” Mogan said. Mogan will be riding the same bike he uses to train and ride for fun during tomorrow’s race — a bike that is tailored to Enduro racing.